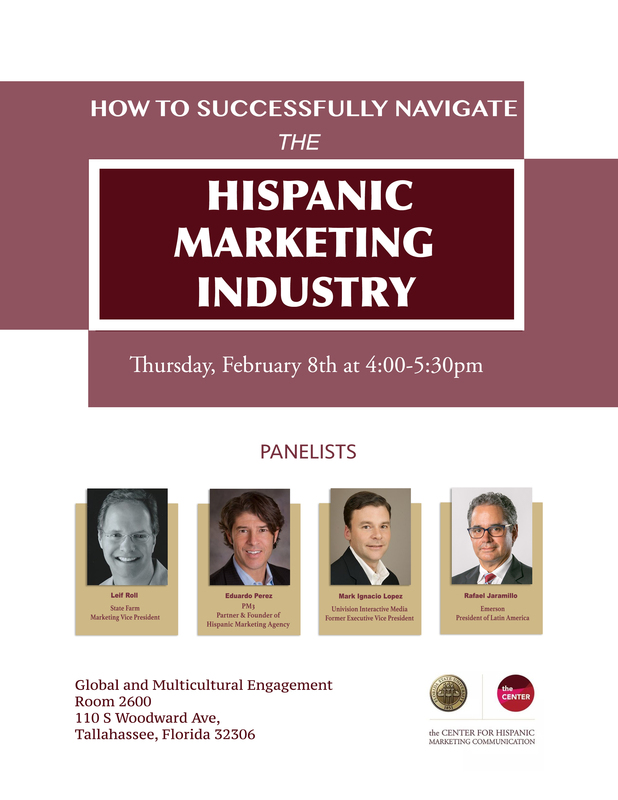 Tallahassee, Fla. — The Center for Hispanic Marketing Communication (the Center) is hosting a panel discussion titled How to Successfully Navigate the Hispanic Marketing Industry Thursday February 8th from 4-5:30 P.M. The panelists will consist of members from the Center’s Advisory Board, who also volunteer as mentors through the Center’s mentorship program. 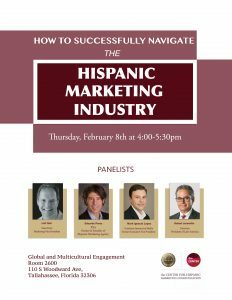 The panelists will share their personal experience within the Hispanic Marketing industry, as well as insightful tips and answering questions. The panel will be held at the Global and Multicultural Engagement Building in Room 2600, 110 S Woodward Ave, Tallahassee, FL 32306. RSVP for the panel today! Dr. Sindy Chapa, Assistant Professor and Associate Director for The Center for Hispanic Marketing Communication in the FSU College of Information and Communication, will be hosting the event. The guess list includes: Leif Roll, Marketing VP for State Farm; Eduardo Perez, former VP of Hispanic Strategies for PM3 Agency; Jorge Ortega, Executive VP and Managing Director for Burson-Marsteller; Mark Ignacio Lopez, Univision Interactive Media Executive VP; and Rafael Jaramillo, Emerson President of Latin America. Immediately following the discussion, our guest will participate in networking activities. The Center is extending the invitation out to the Tallahassee community. Anyone interested in tapping into the Hispanic Marketing Industry, or wants more insights on marketing in general is encouraged to come. Make sure to follow the Center’s Facebook or Twitter page to stay up to date on all future events. Posted in Hispanic Millennial Insights Blog.